I could not get ahold of my husband who was at work, an hour away, in a meeting. I have no words to describe how I felt when I had to text him, “Emergency. We are safe. House on fire”. Two hours later, we learn that the entire interior of our home was destroyed. We no longer had a home to go “home” to. The house was uninhabitable and was being condemned. We were uprooted in an instant. We walked away that day, with the clothes on our backs. No toothbrushes, no underwear, no cuddlies for our children. No toys, no food, no books, no special blankies…just the few things we took to the park. 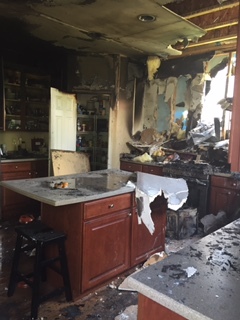 We later learned that I did not turn off a small burner on our stove from earlier that morning. It was on for two hours while I was in the kitchen that morning. I could not believe it. I remembered cooking earlier but I was not rushed nor felt stressed. I was cooking, cleaning, redirecting kids to keep them busy before we went to the park. Just the hour before our departure to the park, I baked blueberry bread for the kiddos. To hurry up and get to the park, last minute, I moved the bread, which was cooling on a plastic cutting board, to the top of the stove, (which I NEVER do). I remember that I wanted to get it off the counter so I could clean up and come home to a clean kitchen. That never happened. My children never returned to that house. Still today, we have not let them see the devastation. They left that morning, toothbrushes on the countertop, toys on the floor, cuddlies on their beds, now destroyed by soot and ash, too far gone to restore. All they had was now gone. And it was entirely my fault. Let me be clear. Even that day, I felt God’s presence. I never felt alone. My husband and I see God’s hand in the many highs and lows of this experience. I am not beating myself up. I am processing and healing, emotionally and spiritually. If you know me at all, you know I NEVER claim to be perfect. I made a horrific mistake. People make mistakes. This just happened to be a terrible and costly mistake. However, by the grace of God, my family is safe. We can replace things, even big, expensive things. I have yet to play the “what if” game. I can’t seem to go there emotionally yet. Maybe I won’t ever. Time will tell. What I knew at that moment was that together, we can figure out the details of what we were going to call home, because we were all together. I could not fathom any other circumstance. All five of us were safe. Period. Obviously, this is an ongoing journey for my family. In fact, it is difficult to write about it when I am still in the throws of this process, almost two months after the fire. Our house is still standing there, with some salvageable things removed, but otherwise, everything still left as it was, the morning of the fire. We anticipate the demolition will begin soon. We are grateful for good insurance and must see this, at times, lengthy process through! In the meantime, we moved from a hotel (where we stayed for three weeks) into a nice single-family rental home, with nice rental furniture, and rental sheets, and rental towels, and rental dishes, rental garbage cans and rental forks, spoons and knives. We are learning about what home is really. Home is not our personal belongings. It is not even the comfort of our favorite pillow, book, cookie sheet, coffee mug, or favorite pair of jeans…(although I would REALLY love my steak knives back! Rental knives are just not cutting it ). Home is TRULY where we dwell together, no matter what walls surround us. This idea of home is the first lesson I have learned in this process. “Home” is where my family talks, jokes, plays, laughs, cries, loses our tempers and our minds, at times. It is where we look at each other and reassure each other with a smile, and say, “We WILL get through this” …even with really dull steak knives. As you can imagine, there are a lot more lessons we are learning, every day. I am sure writing some of these lessons will be part of my healing process. Although, all of the details cannot realistically be shared. There is just too much! There are dozens of people who have helped us, given us shampoo, toothbrushes and stuffed animals for our kiddos, that very first night we spent in the hotel. (Thank you BYNTS!) Friends and family that took our children for hours, days and nights, and clothed us and gifted us in many ways. Our family will find a way to thank our large support network. The support continues and we are so grateful and feel so many of God’s blessings through this. We look forward to continuing the journey with all the ups and downs of this process, moving back to our ‘new’ home and being reunited with (a new version of) our steak knives. PreviousPrevious post:Adults Should Not Ride Kid Bikes #notaruleNextNext post:Two Bold Steps in Overcoming Trying Times. Dear Meg, I heard about the tradegy that you and your husband now have turned into an understanding of the meaning of home and family. Thank you Cousin Alyce and Flo! I am humbled by both of your comments. Thank you for taking the time to post them! We appreciate all prayers and we do feel them! Kids are adjusting and have amazed us with their resiliency! Truly… thank you both! Powerful story, Meg! Thank you for sharing so honestly. Our prayers are with you. I’m so sorry this had to happen to you, but you have blessed many, I’m sure, with this reflection on what “home” is really all about. Some genuinely fantastic blog posts on this site, thanks for contribution. “Careful. We don’t want to learn from this.” by Bill Watterson.